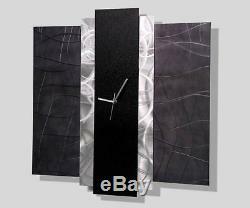 Abstract Contemporary Modern Metal Art Wall Clock - Time Eternal by Jon Allen. 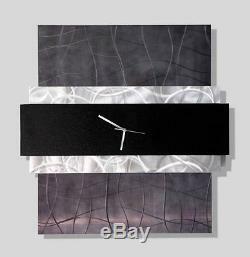 Title: "Time Eternal"&###xA0; Dimensions: 24" x 24" x 2&###xA0; (60.96 cm x 60.96 cm x 5.08 cm). High Quality, Light Weight Aircraft Grade Aluminum Blended and Formulated Colorful Dyes / Pigments UV Protective Clear Coat Finish Battery powered, Quartz Movement tested for time accuracy. Hand Textured and Polished Metal Hand Painted UV Protective Clear Coat Application. Unique styled pre-installed brackets allow for vertical, horizontal or angle display, and'float' the artwork off the wall about 2 inches for added eye catching depth and dimension. Due to a wide variety of wall types, nails/screws are not provided. Set natural or artificial light sources to the desired personal'mood'. This piece stands on its own. Contact Statements2000 studio directly with requests or questions regarding custom designed artwork. All artwork is quality inspected, professionally packaged, and gallery wrapped with the finest materials for safe global transit. It is our commitment and pride to deliver the finest quality metal artwork along with superior customer service. Your total enjoyment and satisfaction is our top priority. Jon's inspiration is at the intersection of architecture and art. He loves clean lines and modern, contemporary art. That connection would prove to be enduring. Today, Jon is revered as an innovator in the metal art realm. His work is well respected, often imitated but never replicated. His command over his chosen medium, metal, is unparalleled. S studio, you would guess you were seeing the work of no fewer than ten artists, each of whom had dedicated an entire lifetime to&##xA0. How could one person so masterfully&##xA0. &###xA0;an ethereal painting of an exotic jellyfish with electric tentacles that looks as though it were painted on glass&###xA0; and &###xA0;an abstract portrait that is evocative of Picasso? Surely not the same artist who just completed an art deco wall sculpture or&##xA0. But you would guess wrong. Jon Allen's unique handmade artwork is enjoyed by collectors all around the world. Each piece is handmade at Jon's South Florida art studio called&##xA0. &###xA0;Jon is best known for his multi-panel wall art, wall sculptures, original paintings, clocks, indoor-outdoor sculptures of all sizes, and unique handmade decor items like mirrors. Jon's family of collectors never ceases to amaze him. Everyone at Jon's studio loves the stunning photos of Jon's work that his collectors send and we proudly share those images on our website &###xA0;as well as on our Instagram and other social media outlets. Jon's work has been seen in major motion pictures like. And has also been featured on popular television series like. Statements2000 and jonallenmetalart&###xA0;are the only two official&##xA0. Purchasing from us ensures you're receiving authentic, brand new, signed artwork that includes a certificate of authenticity. Since Jon is the original and premiere metal artist of the internet, his work is often copied. 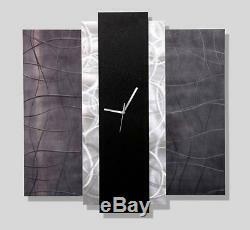 The item "Abstract Contemporary Modern Metal Art Wall Clock Time Eternal by Jon Allen" is in sale since Tuesday, March 18, 2014. This item is in the category "Art\Paintings". The seller is "statements2000" and is located in West Palm Beach, Florida. This item can be shipped worldwide.